but with muscle and versatility. Turn on the Jour de FET and you'll get a distortion feast! From clean sound to way too much saturation, from British to US voicing, a large choice of saturations is available with this pedal. First, the jour de FET uses FET transistors to produce the distortion. FET transistors are known to mimic pretty well the response of a tube, producing distortion more pleasing to the ear with cool response to attacks and good dynamics. Then, a switch allows to choose the number of stages of distortion. With two stages the pedal produces warm clean tones up to very dynamic crunches. With three stages the sound becomes a bit more compressed and a very very very high level of saturation can be obtained. Last but not least, two internal controls allows to radically change the voicing of the pedal: A dip switch allows to switch between 4 different voicing: the first is bright and "British", the second cut some high mid and is a bit dark for a more "US" tone, the third cuts even more the high mids, and the fourth boosts the mids for a more 70's like sound. Then the balance between bass and trebles can be set with a trimpot. 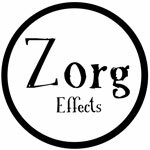 Listen to a Zorg Effects distortions pedals comparison here.